Because of the intricacy of some Pitchers’ baseball workouts require, they often only address one skill or issue at a time, which although being a necessary evil, sometimes in a short and compact season this may seem like a waste of coaching time. The Long Toss workout, although primarily being an arm strengthening workout, can easily be varied in order to address additional important skills and issues facing a pitcher. (4.) Increases skill of developing arm speed, while simultaneously increasing their skills at throwing a change-up and its’ grip. (6.) 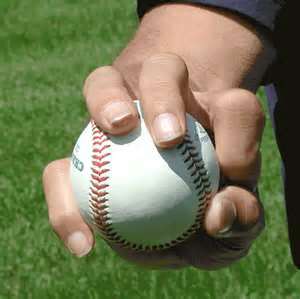 After 5 throws change to a Change-up grip, continue the crow hop and bounce, for 15 throws, more or less according to how the pitcher is feeling. Most problems associated with any pitcher, regardless of age, throwing a change-up is arm speed, or perhaps lack of arm speed better describes the issue. When slowing the arm speed, even slightly, it disrupts the pitching mechanics and makes the ball much more difficult to control. More importantly, off speed pitches are designed to be deceitful and are intended to disrupt a hitter’s timing and weight distribution. 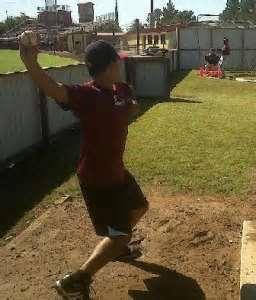 Telegraphing a change-up through a slower arm speed allows the hitter to recognize the pitch and enables him to keep his weight and hands back. A real Bad scenario for a pitcher. Utilizing a change-up grip while throwing 80‘, incorporating a crow hop, and using fastball arm speed, is a tremendously effective drill for improving the throwing motion of the change-up. A drill to improve a pitcher’s, or any player for that matter, balance, awareness and sense of direction, is to have the pitcher throw with his eyes closed. Once the pitcher has completed his throwing drills and is warmed up and accustomed to the throwing distance, have him pick up his target, then close his eyes, crow hop and throw to his partner. It always helps to have a coach monitor this, but it’s not absolutely necessary, because if the ball is thrown to the partner’s right, the pitcher is too closed, thus his shoulders are not square to the target. Ball thrown to the partner’s left, the pitcher is too open, shoulders again are not squared to the target. It’s not imperative your pitchers be able to throw blindfolded, however, any time a player can improve any of the body’s senses in order to pitch, the better. Balance and awareness are huge contributing factors to pitching. (3.) A long toss session in the morning or early afternoon will have no negative affect on the pitcher for a night game.